BEGINS CELEBRATING ITS 400TH ANNIVERSARY THIS MONTH, AND you’re invited to the party. Like Spanish gold hunters who “discovered” this scenic area of northern New Mexico-native tribes already knew about its high-desert beauty limned by the Sangre de Cristo Mountains-you can explore its many riches. Awaiting discovery are not only sixteen months of festivities starting Labor Day weekend, as well as recently expanded tours by a former assistant of Georgia O’Keeffe to the artist’s house at Abiquiu, but also tasty adventures in Southwestern cooking. 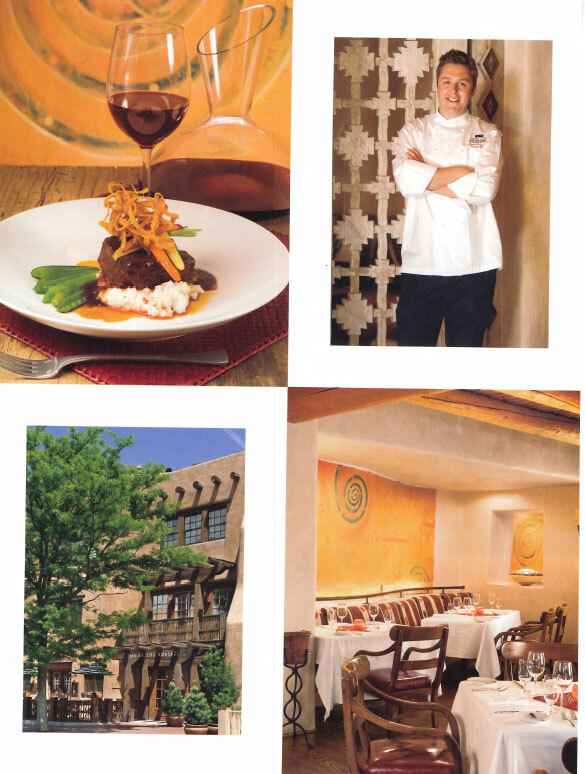 Executive Chef Oliver Ridgeway, a culinary conquistador from The Carlyle in Manhattan, is whetting appetites for savory local flavors at the charmingly rustic yet refined Anasazi Restaurant at the Rosewood Inn of the Anasazi. The Mobil Four-Star boutique hotel is just steps from the plaza and the sev­enteenth-century Palace of the Gover­nors in the heart of old Santa Fe. For his north-of-the-border cuisine, Chef Ridgeway, a native of England, brings to the table a globe-trotting background that includes his classical training in French cooking and stints at major British hotels, on board the Queen Elizabeth 2 luxury liner, with the 2000 Olympics culinary team in Australia and at Rosewood’s Jumby Bay island resort off Antigua. More recently, he spent three years at The Carlyle, serving as executive sous chef. While in New York, he was invited to cook at the James Beard House. 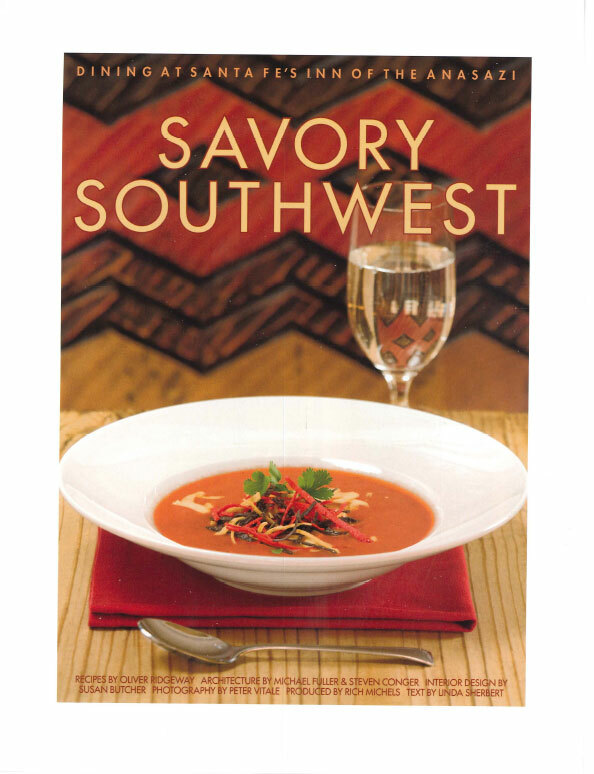 Since moving to Santa Fe, Ridgeway has immersed himself in the culinary culture of the city, where Old West meets new sophistication. Something of a landmark-eye-catching from the street because of its deft interpretation of Pueblo design elements such as log beams, or vigas, protruding from the front facade-the inn has been rein­vigorated during the past several years. Rosewood not only imported Chef Ridgeway but also enlisted the late Santa Fe interior designer and architect Susan Butcher to redesign the guest rooms, which offer kiva fireplaces, as well as the restaurant, in a style befit­ting the city’s blend of Anglo, Hispanic and Native American traditions. The talented interior designer not only honored the ancient tribal design legacy but also sought organic solu­tions. She acquired large Santa Clara Pueblo blackware pottery for the public areas. Freshening fabrics and furnishings throughout the inn, she also favored rustic touches such as the restaurant’s interior window shut­ters, made of skinny twigs that filter the late-afternoon sunlight dancing brightly on a glass of chardonnay. 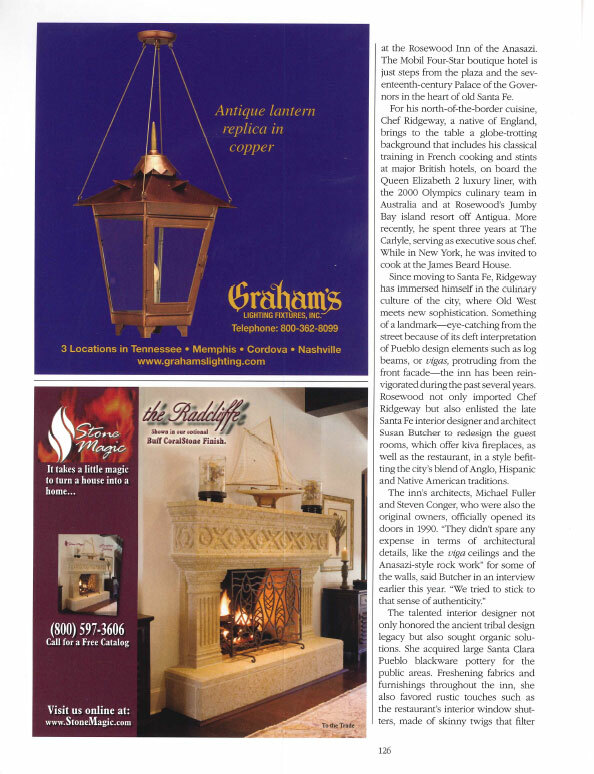 After a day of perusing antiques, handmade jewelry and Pueblo pottery at intown shops and visiting world­class galleries and museums, perhaps even taking the Georgia O’Keeffe Mu­seum tour to Abiquiu, there is a homey feel in returning to the inn with its fire­place ablaze in the lobby and its comfy leather lounge chairs. 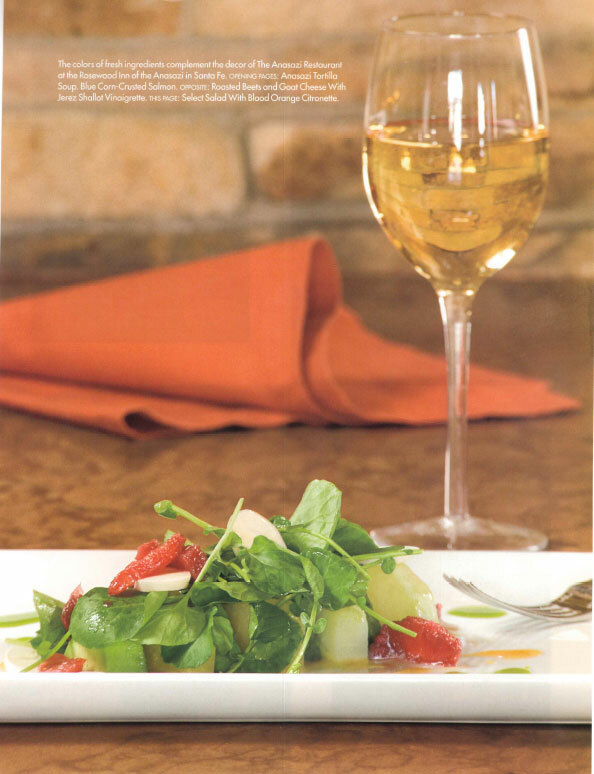 Or you can sit down to Chef Ridgeway’s unfussy “contemporary American cuisine” in the equally unfussy restaurant. Santa Fe’s colors, those of the desert and the festive atmosphere of the city, reappear in the food that is served. For an appetizer, Chef Ridgeway marries the earthy essence of red and golden roasted beets to creamy, mascarpone­enriched goat cheese on a crimson smear of beet reduction. 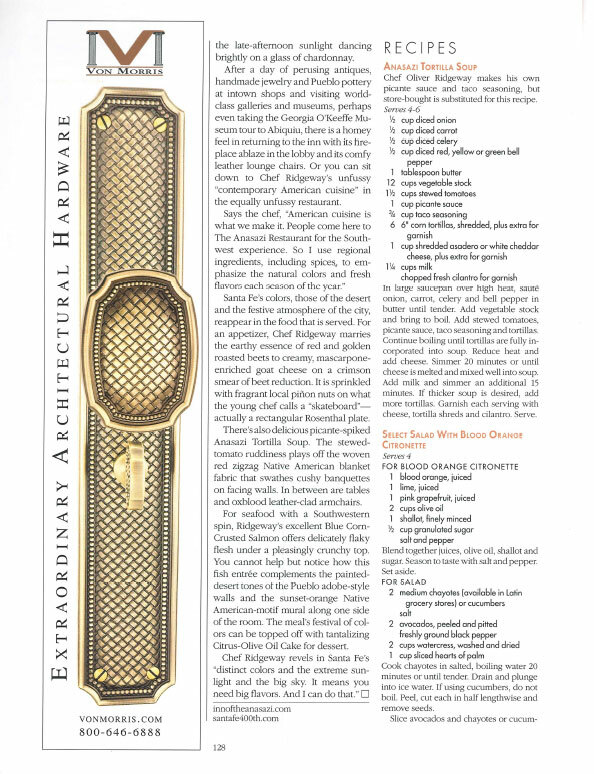 It is sprinkled with fragrant local pin.on nuts on what the young chef calls a “skateboard”­actually a rectangular Rosenthal plate. There’s also delicious picante-spiked Anasazi Tortilla Soup. The stewed­tomato ruddiness plays off the woven red zigzag Native American blanket fabric that swathes cushy banquettes on facing walls. In between are tables and oxblood leather-clad armchairs. 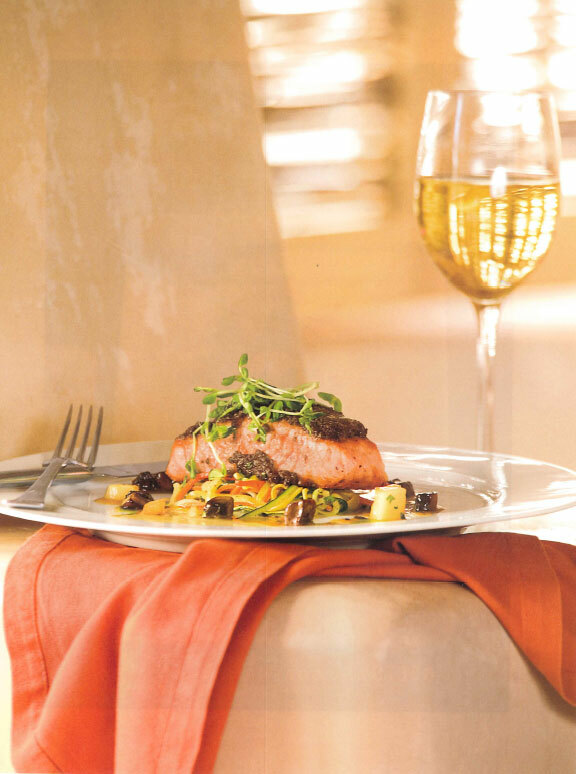 For seafood with a Southwestern spin, Ridgeway’s excellent Blue Corn­Crusted Salmon offers delicately flaky flesh under a pleasingly crunchy top. You cannot help but notice how this fish entree complements the painted­desert tones of the Pueblo adobe-style walls and the sunset-orange Native American-motif mural along one side of the room. 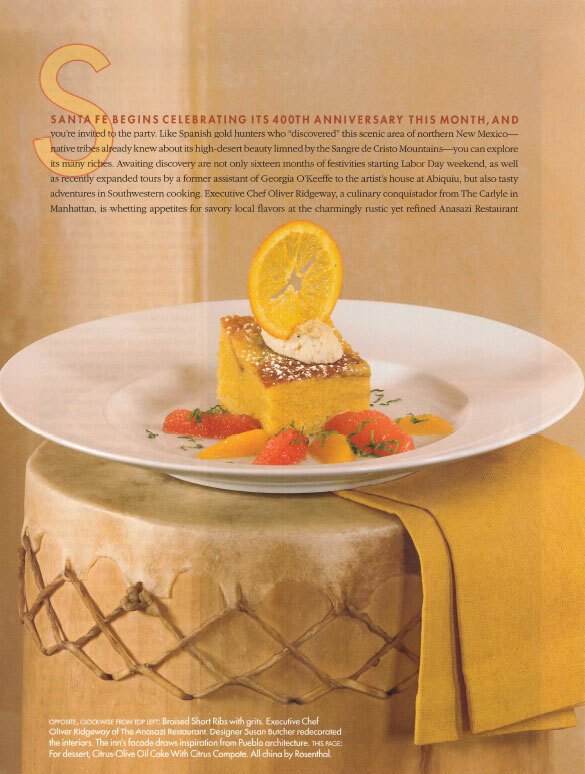 The meal’s festival of col­ors can be topped off with tantalizing Citrus-Olive Oil Cake for dessert.